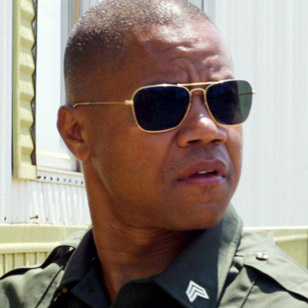 In the movie Linewatch, Cuba Gooding Jr. wears a pair of aviator style Ray-Ban 3136 Caravan sunglasses. 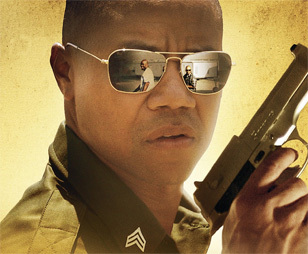 The glasses can be seen on the movie poster / dvd cover, as well as in the film. On the poster the glasses have been photoshopped to create a 'mirror' effect, but the lenses on the film are regular dark grey lenses. Get the Ray-Ban 3136 Caravan online at Amazon.com, Amazon.co.uk, FramesDirect or eBay.